Vestibular testing involves a series of tests that are administered when you are experiencing dizziness. They are used to determine whether symptoms of dizziness are being caused by the balance system of the inner ear. The vestibular system is complex and responsible for many of the body’s functions. In order to narrow down the exact cause of dizziness, it is necessary to administer a variety of tests. These measure eye movements, head movements, hearing and more. Videonystagmography (VNG). This series of tests measures eye movements using an infrared video camera attached to a pair of goggles. VNG tests usually consist of four parts: evaluation of rapid eye movements, tracking tests to measure eye movements as they follow a visual target, positional test for measuring dizziness in response to different head positions and a caloric test that measures responses to warm and cold water circulating through a tube in the ear canal. Most people reporting dizziness or vertigo will be given VNG tests initially. Electronystagmography (ENG). This is similar to VNG testing, but electrodes are placed around the eyes to measure movement instead of goggles attached to an infrared camera. The same four-part testing process is utilized. CDP tests measure how well the visual, vestibular and sensory systems work together to maintain balance. With this test, you stand on a platform and follow a visual target while platform movements record the degree to which your body sways. It includes an Adaptation Test in which the platform moves up and down and a Motor Control Test where the platform moves forward and backward. These are used to measure reflexive responses to unexpected movement. CDP is frequently used those undergoing vestibular rehabilitation. Vestibular Evoked Myogenic Potential (VEMP). VEMP testing is used to determine whether the saccule (an inner ear organ) and vestibular nerves are functioning properly. Electrodes are attached to the neck and sounds are transmitted through a pair of earphones. The electrical response of the sternocleidomastoid muscle in the neck is recorded. Rotary Chair Tests. 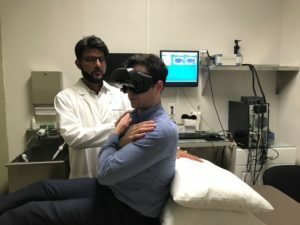 The rotary chair test measures eye movements in response to corresponding head movements; it is used to determine whether symptoms are related to an inner ear disorder or a brain disorder. Like the ENG and VNG tests, either electrodes or a goggle-mounted video camera is used to record eye movements. You are seated in a computerized chair that moves. This test provides more detailed information about the function of the balance system than an ENG or VNG test. These tests may be combined with additional hearing or diagnostic tests depending on the results.